If you’re searching for the best Houston TX kids spas, look no further! We offer all of the most incredible and fantastic features. It’s a sparkling and exciting affair that your child will never forget. Not only will it bring your child joy but it will be a huge relief on the parent’s side. How difficult is it to plan, manage and enjoy your child’s birthday party? Rock Star kids spa parties can take care of all that work so you can just go straight to enjoying the special day. It’s going to be memorable after all, because we spare no expense in throwing the best parties for your child. Our high-quality experience is second to none when you’re looking for kids spas and we’ll show you why. Check Out Our Packages, What Fits Best? We want to offer benefits and amenities that make your child feel like they are in first class. They will be treated to a luxurious and energetic time that will have them feeling special and pampered. It’s our job to give a class act that leaves you feeling better than you would by just planning your own party. 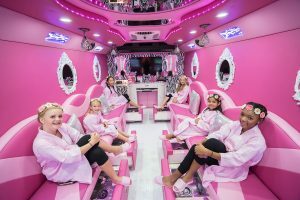 While they are marveling at our premium bus, our employees will be showering your child and her guests in spa treatments such as a pedicure, manicure and make-up specials that will make them as beautiful as ever. Just imagine their smiles as bright as can be, their eyes will shine like jewels! Our Pedicures Are The Main Event! We know that it’s not just the party bus that grabs your attention. Having a spa on the go isn’t fun unless it’s a great spa, too! Fortunately, we’ve got you covered. We want to ensure you that our spa treatment is high class and will spare none of the features and benefits that you would find at a regular spa. Rockstar Pedicure Mobile Spa is uniquely equipped with finer components making the combined experience a synergistic blend of form and functionality. Complete with the great durability of proprietary stainless steel, we then add beauty and solidity to the pedicure foot bath. It’s not just a spa, its got our own unique touch to it! We make sure Rockstar Spa Pedicures are the most exquisite of all mobile spas. The pedicure Base is equipped with Pipeless Whirlpool, Hand Crafted Fiberglass Base, Shower Sprayer, Single Handle for Hot and Cold Water Faucet and Color therapy LED Light. This is to ensure that your child receives a spa treatment just as great as a chauffeured drive around town! The Rockstar Spa Bus parties come to your home or venue of your choice. We bring the spa to you! All you need to do to prepare for a Rockstar Spa Bus party is follow these few requirements and then we’ll take care of the rest. Please be sure to secure parking/hotel clearance for the bus. When you’re looking to reserve a party date and time in the Houston area, we will make it a simple process by referring you to an easy to use booking form that takes care of all your requests. As long as you’re bringing your children, we will bring the party! We have plenty of party hostesses who will make sure everything needed for your spa experience. This will include robes, polishes, party props, music, and much more. Make sure that your children and her guests have their nail polish removed from their toes and fingers. Also, please make sure they are clean and ready for the spa! Let us know when booking your party if you have any special space restraints and we will tailor your spa experience to meet your needs. Parents, unfortunately, we don’t have the space to allow you to join the ride so it’s up to your kids to enjoy the experience! Another thing to note is that we will also require access to electricity and running water. I cancel my party, what will happen? There is a 72-hour notice that we require with all cancellations and rescheduling or you will risk forfeiting your deposit. We strictly enforce this due to the reservation nature of our business. Don’t worry though, we will make every attempt possible to reschedule your party. Let us know the desired time frame you prefer should you need to reschedule. Furthermore, if Rockstar Spa Bus cannot make it to your party whether it be due to bad storms or unforeseen mechanical failure, we will certainly return your full deposit. Of course, we will always be open to making alternate party arrangements that are acceptable to the party host. Contact Us Now For Your Party! 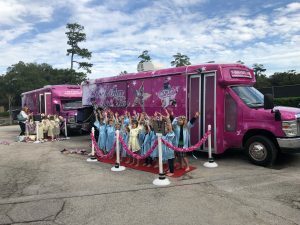 RockStar Spa Bus loves to bring one-of-a-kind experiences to your daughter and her friends, it’s our pleasure to provide a happy time and make her feel like a rockstar! If you need spa parties set up, please feel free to sign up for a time. We will get back to you promptly with the information on what to do next! If you want to find out more about our setup and what we have to offer, you can visit our website or give us a call at 1-844-GIRL-SPA (4475-772). Let us set up your little girl’s perfect party, we hope to hear from you soon! Houston is the second fastest-growing major city in the United States, falling just short of New York City, and is poised soon to overtake Chicago and become the third largest city in the country. The Houston metro area takes up 8,778 square miles, making it bigger than the state of New Jersey but slightly smaller than Massachusetts. Houston might be known for its heat and Texas sunshine, but it has its fair share of stormy weather. The city gets an average of 45 inches of rain every year — about 10 inches more than Seattle. For more info on Houston, click here to get all the information you desire.